Just completed, this extraordinary home is the latest by renowned Hillsborough builder, Thorenfeldt Construction. The style is contemporary perfection with sleek, crisp white walls, 12-foot ceilings, and interior doors reaching 10 feet. Floor-to-ceiling glass doors disappear into the walls for a seamless connection to the outdoors while clerestory windows appear at every turn, filling the home with amazing natural light. Natural finishes of cedar accent the walls around one of two staircases to the lower level, European white oak floors unify the entire main level, and a vast deck of Brazilian hardwood provides for outdoor living. Details far exceed most new construction with lighting that is not only functional but artistic, and European avant-garde cabinetry with a white lacquer finish that adds to the home’s minimalist perspective. The home has tremendous formal and everyday living spaces with a great room that is certain to be the central gathering place with its easy connection to the outdoor kitchen, pool, spa, bocce ball court, and fire pit. There are 5 bedroom suites, including four on the main level and one privately located downstairs in its own secluded wing with a spacious patio and direct access to the front grounds. The entire floor plan is incredibly flexible and therefore perfect for any lifestyle need. A second lower-level wing has a full bath, sommelier-worthy wine cellar, and the pièce de résistance – a recreation room finished in loft style with industrial ceiling and brick wall. This grand space can be used as is, converted to multiple rooms for such amenities as fitness and media, or even used as a venue to showcase a car collection with its easy access from the driveway. The property spans over three-quarters of an acre overlooking the valley and includes a rare level yard for play and views that reach out to the East Bay hills. 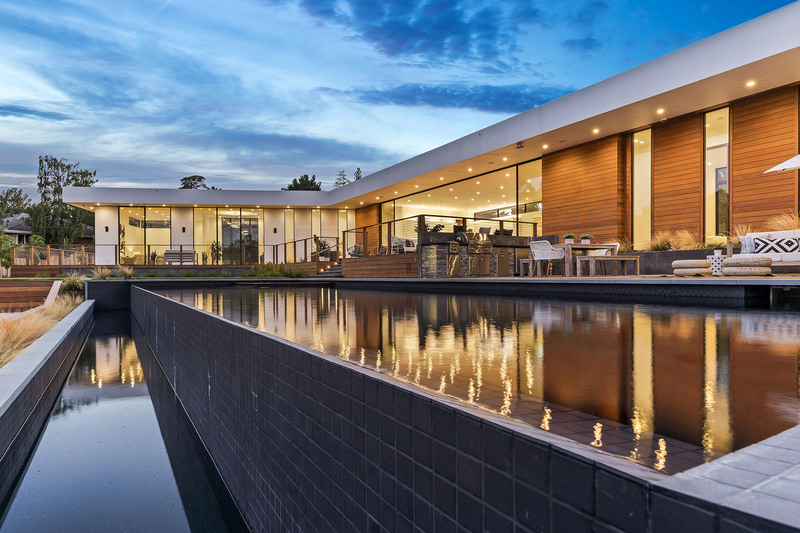 With resort-inspired grounds, exceptional contemporary style, and an outstanding location midway between San Francisco and Silicon Valley, this is indeed a very special opportunity for luxury living.